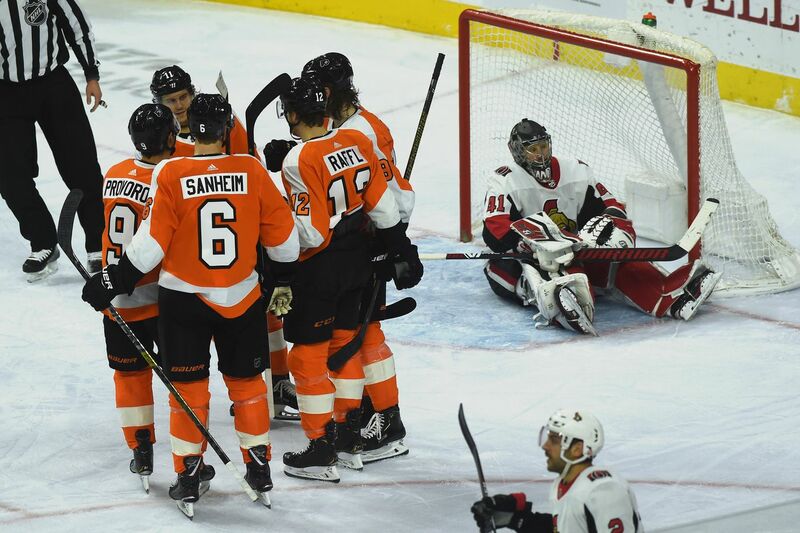 Ottawa goalie Craig Anderson sits in the crease as the Flyers celebrate a second period goal by Michael Raffl on Monday. The impossible now seems possible. Sparked by a dominant second period, the Flyers continued their second-half playoff charge Monday night as they outlasted the worst-in-the NHL Ottawa Senators, 3-2, at the Wells Fargo Center. Oskar Lindblom, Michael Raffl, and Scott Laughton each scored in the second period as the Flyers climbed to within three points of an Eastern Conference playoff spot with 13 games remaining. It’s the first time they’ve been within three points of the playoffs since Nov. 20. With an 18-4-2 run, the Flyers are within striking distance of becoming the first team in NHL history to reach the postseason after facing a 16-point deficit at any point during a season. “We take it one game at a time,” said Laughton, whose team hosts powerful Washington, the defending Stanley Cup champion, on Thursday. “We’ve got a huge stretch coming up and that’s going to make or break the season, I think. It’s good we’re playing good hockey in this stretch, but it doesn’t mean anything if we can’t have a good outing when we play” upcoming games. The Sens cut it to 3-2 when Filip Chlapik, recalled from the minors earlier in the day, scored with 2 minutes, 57 seconds left in regulation, but the Flyers survived. Lindblom and Raffl scored four minutes apart early in the second period to put the Flyers ahead, 2-1. A bad-angle shot by Shayne Gostisbehere from near the boards deflected off Sean Couturier’s knee and Lindblom’s left skate – call it the Double Doink, Part II – to knot the score at 1-1 with 17:58 left in the second. It was Lindblom’s 13th goal, tied for fifth among NHL rookies, and his fifth tally in the last 11 games. Raffl (two points), playing in his 400th career game, was the benefactor of Patrick’s persistent forecheck. Patrick took the puck away from defenseman Mark Borowiecki and fed Raffl for a backhanded tap-in with 13:58 remaining in the second. With 37 seconds left in the period, Laughton, on a four-on-two break, scored his 11th goal, a snap shot from the high slot after a nice feed from Travis Konecny to give the Flyers a 3-1 lead. “T.K. made a good play and I just tried to get it off as quick as I could,” Laughton said. The Flyers, playing without high-scoring Jake Voracek, their suspended right winger, had a territorial advantage but left the ice facing a 1-0 deficit after the first period. Ottawa goalie Craig Anderson (33 saves), looking for his first win since Dec. 17, was the main reason as he stopped 10 shots in the first. The Senators, who lost their fourth straight game, took a 1-0 lead when Chris Tierney, stationed in the right circle, deftly tipped Ben Harpur’s point drive, with the puck taking one bounce past goalie Brian Elliott (20 saves) with 10:12 to go in the first. The Flyers kept swarming and took control during a 3-0 second period in which they outshot the Senators, 15-5, en route to handing Anderson his 13th consecutive loss (0-12-1). Suddenly, sneaking into the playoffs, though the odds aren’t in their favor, isn’t as unrealistic.